If you look very carefully, you’ll note that this card’s art seems to be a companion to and/or an alternate, equally unsettling view of the event taking place on the Urza’s Saga version of Dark Ritual. Dark Ritual, of course, includes a quote from these very scriptures exalting Yawgmoth; the rest of their contents is not known in great substance or detail, but additional quotations from them do appear on four other cards from the Urza block. Looking over them for this review, I realized that some elements of New Phyrexia draw on the Scriptures. Bog Raiders’ flavor text sounds a lot like Vorinclex’s philosophy, and Sanguine Guard foreshadows Elesh Norn’s path to enlightenment via mutilation and dismemberment. Yawgmoth may not have been the original creator of Phyrexia the plane, and he is long dead and entombed in Urborg, but clearly his spirit lives on in what was once Mirrodin. So there’s a long history of exploring Phyrexia’s philosophy in flavor text, but even without that benefit, the Scriptures encapsulate it in a clever way. We saw in New Phyrexia that Phyrexia really is a philosophy and not confined to one part of the color pie or one or Magic’s card types, but it is nevertheless strongly associated with artifacts and artificial life. The second and third abilities allude to both the Invasion and to the fall of Mirrodin – the destruction of non-Phyrexian life and the replacement of its history with Phyrexia’s. Of course, the question as far as game mechanics go will be: how do these powerful effects relate to the cost and to what other decks might try to do? Four mana is about what you might pay to get the second and third effects right away, but in this case you’ll have to wait around for them. That does make a risk that your opponent will find some way to get around them, but it also gives you a chance to set up for them and gain more of an advantage. Additionally, artifact creatures are somewhat of a staple in Commander and multiplayer formats (cf. Solemn Simulacrum, Filigree Familiar, Duplicant, etc), which means you can use it as not only a one-sided sweeper but also a political one in certain circumstances. One last thing: I do believe that is a watermark under its text, the same one borne by the Praetors and minions of New Phyrexia. It might make for a slightly jarring tonal difference, but you can now combine it, and them, with cards like Watermarket . . .
Today we look at our first Saga card. Saga’s are a new kind of Enchantment that triggers once a turn, over the course of three times. They are instantly recognizable by the new card frame and grandiose art. Each card is flavored after an event in Dominarian history. Also of note is that Sagas are “historic spells” and thus have a lot of support cards in Limited. If you want some Enchantment shenanigans then try adding some cards from Theros. It is a bit weird that Sagas aren’t Legendary though. Its hard to predict how much of an impact Sagas will have. Remember that when Planeswalkers came out there were a lot of people who considered them bad. The biggest weakness of Sagas is that you have to protect them to reap the full benefits. Four mana for a +1 is not a good investment. 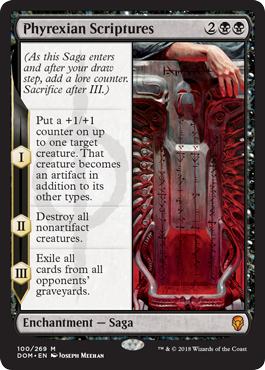 Appropriately enough, since Red and Black can destroy Planeswalkers, they have no way of destroying Sagas. This could potentially result in a surge of Green or White decks. In Standard we have Naturalize back but Limited has just a handful of Enchantment destruction. Phyrexian Scriptures in a vacuum is straight forward. Your best creature gets stronger and everything else gets killed with no hope of return. This card might make ripples in Standard as Kaladesh has plenty of artifact creatures and Amonkhet has a bunch of reasons to exile a graveyard. While I usually automatically give board wipes a 4 or higher in multiplayer, Playing Phyrexian Scriptures is going to paint a huge target on you. Play with caution. Due to the deck building restrictions of Commander artifact creatures are common in the format. Your Damnation mind end up a bit underwhelming. “Sagas” are the newest Enchantment subtype, loosely based off of the original concept for Planeswalkers. You get effects from them thrice: when it comes into play, and after your next two draw steps. Phyrexian Scriptures was the first Saga to be properly spoiled, and…well, it’s sorta kinda a delayed Damnation. By “delayed”, you have a chance to respond. And by “sorta”, you get to protect any artifacts before things blow up. Conveniently, Phyrexian Scriptures lets you mark one of your creatures (if you have one) for protection and give it a nice buff. And the third effect is sort of icing on the cake, making sure (if they don’t react quickly) that your opponents never see their creatures again. I think Phyrexian Scriptures is going to see play; while not nuking everything immediately is unfortunate, it’s as close to a four-mana Wrath as we’ve seen in a while, and there are ways to make it a bit more favorable to you. Definitely be wary of this card.